In conjunction with St. Patrick’s Day, this entry is gonna be about what the Irish is famous for – Guinness! 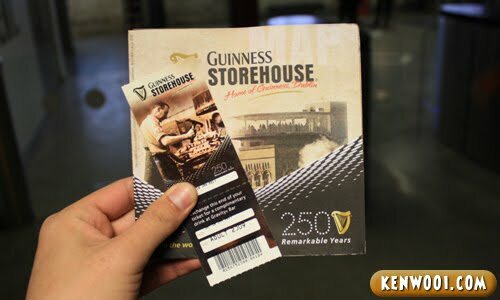 While I was in Dublin, I had the chance to visit Dublin’s top attraction, which is the Guinness Storehouse. It’s the number one visitor attraction over there. A must visit! 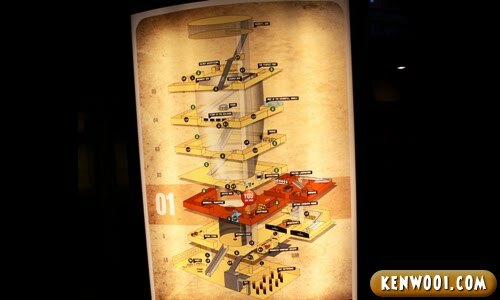 Consider yourself lucky (if you haven’t been there) as kenwooi.com will bring you on another virtual tour! An entrance fee of €13.50 (RM67.50) will be charged for an adult. But since I had my Dublin Pass with me, it’s free. Actually paid lah since the pass cost €44.00 (RM220.00). The adventure begins the moment you walk through the door and into the building’s giant, pint-shaped heart of glass. This 7-story building is dedicated to the history of making of this world’s famous beer. 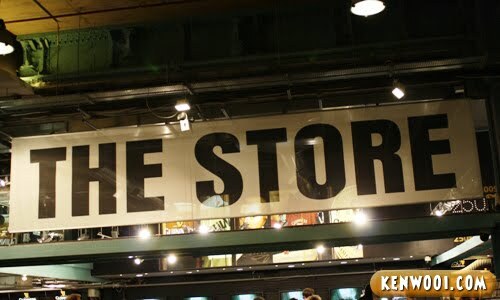 At the ground floor, there is a retail store selling all kinds of Guinness merchandises. I didn’t buy much though, but I got a wallet for dad. 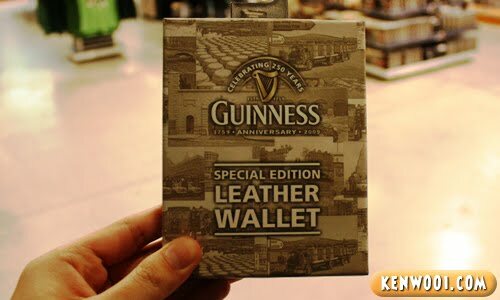 Leather wallet – his favourite but he’s not using it anyway. The tour starts at level 1, where the Master Brewer guides us step by step through the brewing process. 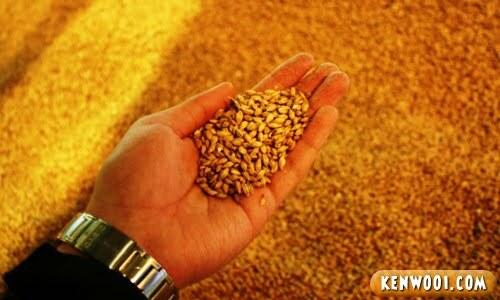 Barley is malted, roasted, milled, mixed with hot water and mashed, then the liquid is filtered off and boiled. Yeast will be added and the fermentation begins. The next station is the tasting laboratory, where you can sample the finished product. 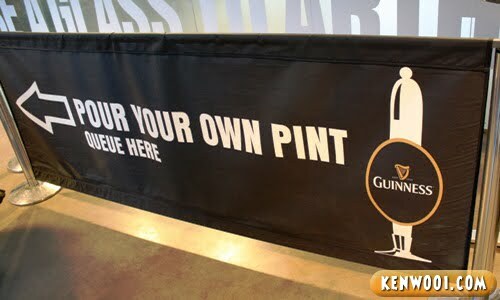 After that, the Guinness Advertising area is on the 2nd floor. 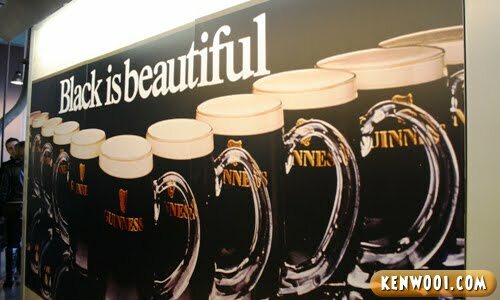 Guinness has certainly left its mark on the history of advertising world wide. 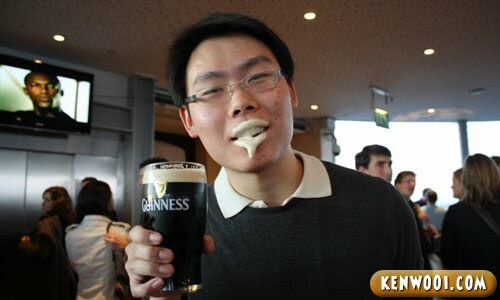 I’m not sure whether Guinness is really good for me, but it’s definitely good for the Irish. They drink Guinness all day, just like how we drink water. And at the 3rd floor is the Brewery Life. The tradition of Guinness continues in which you learn stories, see how your body responds to alcohol and quiz yourself. 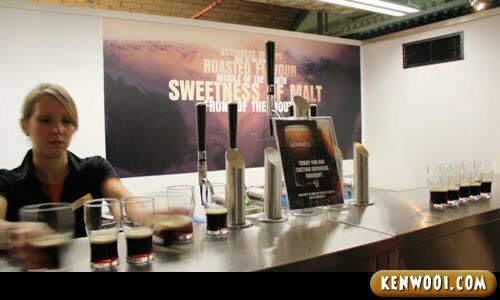 Then at one of the later floors, there’s a place where you can pour your own pint of perfect Guinness. 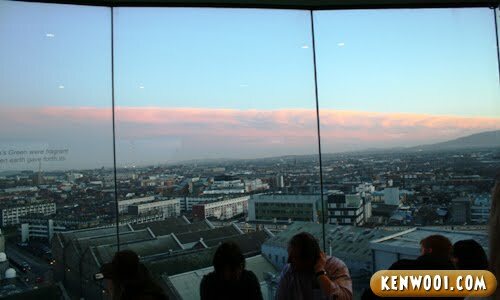 I didn’t try that though, and then continued to the Gravity Bar – located at the 7th and highest floor in the building. 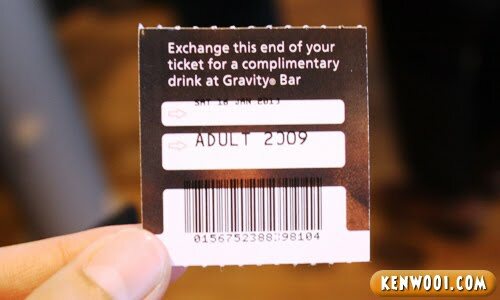 With the bottom portion of the entrance ticket, each visitor can enjoy a complimentary pint of Guinness. 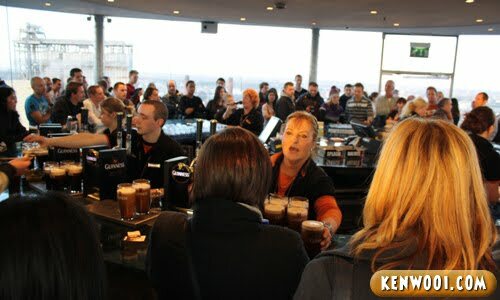 And at the same time, drinking with the unique 360° panoramic view of Dublin city. It was almost sunset when I reached the top. The bar was very crowded, everyone was holding a pint in their hand. 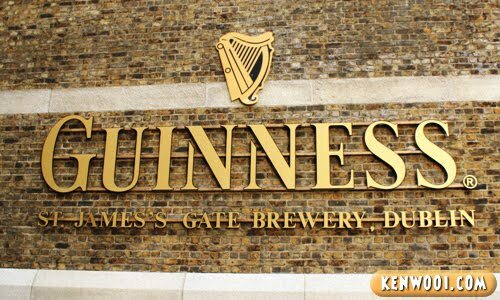 These are what they claim Guinness at its best, because it’s freshly brewed. My pint of Guinness and I. Just look – so creamy and delicate. It’s actually Guinness Draught, not Stout. I personally find Guinness Stout unbearable! Guinness Draught on the other hand, was good! 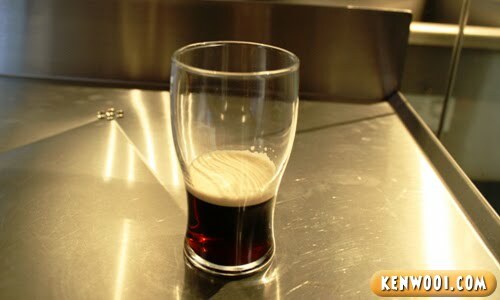 I don’t like drinking but I managed to finish up my pint. Anyway, ever since I left Dublin, I’ve yet to savor another Guinness. That’s why this experience is definitely an unforgettable one! 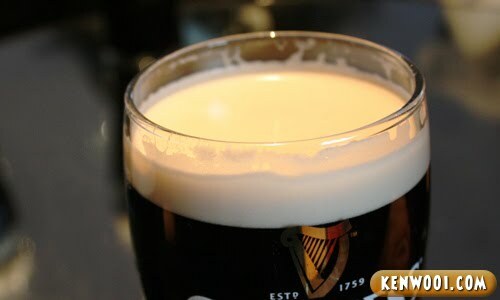 Just look at how I savored every “amazing” drop of Guinness at Dublin! Okay, that’s not one of my best personal photos. 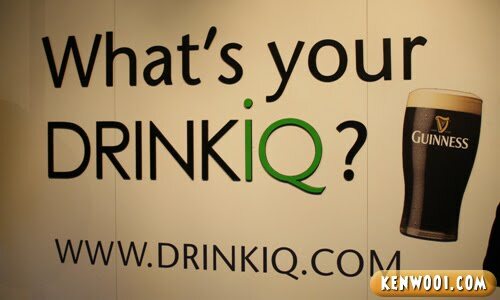 So yeah, that’s all for now, I hope you enjoyed this virtual tour, specially brought to you by kenwooi.com! LOL…. stout tastes SUX! That’s an undeniable fact. I am imagining the last pic with red bubbles. You will look like vampire. Nice visit over there. Whoa.. Last picture was.. Errr.. Quite cute though.. Ahaks..
Wow.. The pass are quiet expensive.. Happy St.Patrick Days to you too! 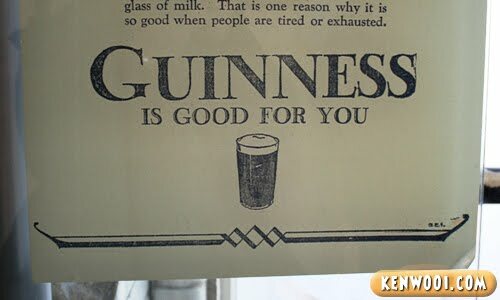 Yes, Guiness is definitely good for you. My dad would have died without Guiness. It’s good when you have asthma and still want to sleep in aircond room. the last photo just so sweet! Hahaha..you look like some peverted zombie in the last pic.. I get very mad everytime I read ur blog. CAN C CANNOT GO!!! ARGH! Nice… Me never been there before. it’s a forum for casual chats and hobbies discussions…hope u can visit and be a regular member..thanks! Thanks for the virtual tour, yeah black is beautiful prefer kopi ‘o’..haha.. I saw my friend who is in Ireland for her medic been enjoyed herself much pouring her pint of Guinness but she just took a sip and that;s all..
Ha..ha..ha..the last photo so cute & funny too! Semms to be a cool place….expensive entrance fees!!! I’m not wearing green today, but I’m so green with envy! 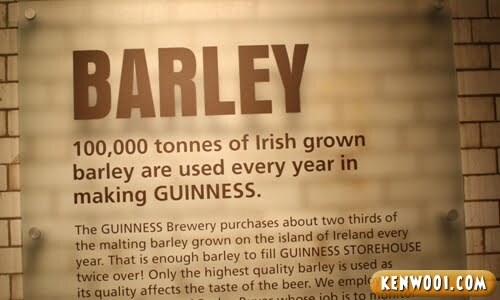 Not that I drink, but I reckon the chance to get to know how GUINNESS is produced would be priceless! You sure you scored all in IQ test ar? 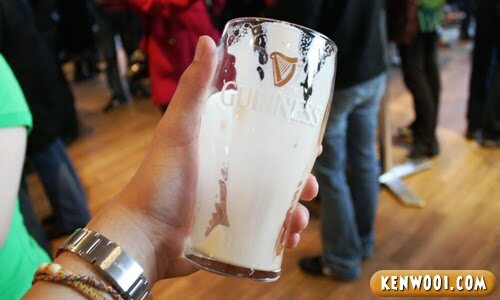 Hehehe…Freshly brewed Guiness, I want! 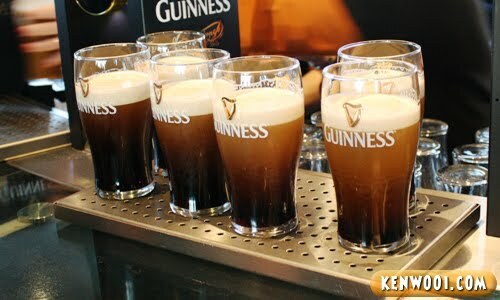 does it taste the same… i mean the malaysian guiness and the one that u had over there? Yeah, those beer pictures really got me thirsty. Great post, as always! Keep it up, dude. *Pinches* You’re not wearing green!!! paiseh.. so expensive!! better watch Super Junior Concert in Malaysia. anyway the last pic is gross! lol. the last picture tells me you are very overwhelmed with joy on that glass of guinness you are holding. This is nice~.. Oh so its in Dublin! :D I’ll be going to Ireland in 2 weeks too! 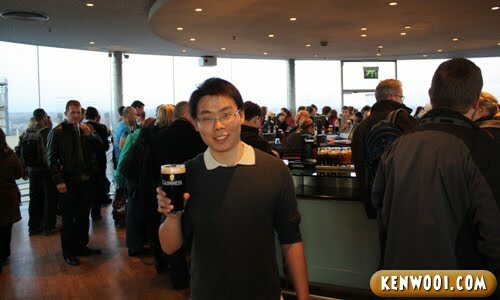 Happy St. Paddy’s Day and hope UK is treating you well, Wei Ken! Your blog makin canggih. hey..btw ken, i saw ur blog in a small section of ‘The Star’ last Wednesday..
Black is beautiful and hey, you are in black too. Great virtual tour. Thanks. The last pic is cool!! !